If you see a Trinidadian guppy with black eyes, watch out– they’re feeling aggressive. Well, Trinidadian guppies are pretty tiny so you don’t really need to watch out, but other smaller guppies should. Researchers from the University of Exeter and the University of the West Indies made little robo-guppies with black eyes to see how larger guppies would react to them. Dr Robert Heathcote, lead author of the study and from the University of Exeter, said: “Trinidadian guppies can change their iris colour within a few seconds, and our research shows they do this to honestly communicate their aggressive motivation to other guppies. A guppy with silver (lower) and black (upper) irises. Image credits: Robert Heathcote, University of Exeter. Larger guppies usually only show black eyes to smaller guppies that they could beat in a fight, and smaller guppies don’t dare to show black eyes to larger guppies. The researchers made realistic looking small robot guppies with black eyes, which were placed to guard a food source. Then larger real guppies were introduced and competed relatively often with the black-eyed robots. The larger fish that competed also usually displayed black eyes. All in all, the guppies then use their black eyes as a signal of aggression, and they really mean it. 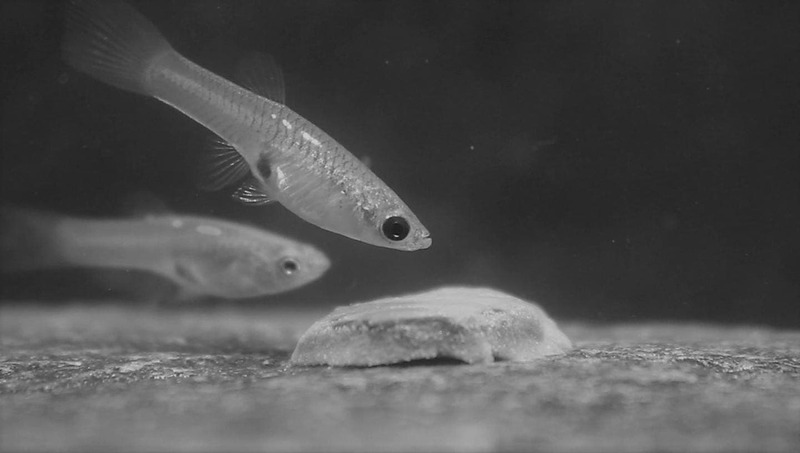 Smaller guppies don’t dare to show black eyes because they know that a bigger fish will take their signal seriously and fight with them, and the smaller fish don’t really stand a chance. There’s no messing around, if you make your eyes black then you have to be prepared to actually be aggressive. Therefore only dominant fish tend to show the aggressive look. Those poor robo-fish must have gotten quite the beating. Journal reference: Heathcote et al. 2018. Dynamic eye colour as an honest signal of aggression. Current Biology.